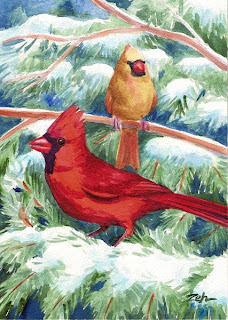 With the first snowfall of the season happening today, I glanced out the window of my studio and saw these cardinals waiting for their turn at the feeder. It seemed that it would make a great painting so I did one! The row of evergreens that lines my driveway has grown over the years to probably 50 feet tall. It makes a wonderful shelter for birds. Cardinals especially appreciate evergreen trees and I see them every day flashing past in a red streak or sitting like this making sure all is safe before venturing to the feeder.